In the marketing and business world, we are always working towards increasing our SEO and lowering our bounce rates. We try various things like incorporating metadata and keywords into our content in hopes of gaining better page ranks and clicks. Another very effective way to increase your page ranks on search engines and drive a greater volume of traffic to your website is through the use of backlinks. Backlinks can be complex and will require time and effort to build or earn, but after discussing their importance in more depth, you will learn how to take advantage of their use to increase your SEO effectiveness. SEO and backlinks go hand-in-hand; you cannot have SEO without backlinks. Backlinks, also called “external backlinks” or “inbound links,” are created when an external website links to yours. Backlinks help Google and other search engines find new pages. There are a number of different tactics you can use to obtain these backlinks to your website. One approach is to target free internet directories, article directories, link exchanges, and link bait — but we don’t recommend it. Recently, search engine companies, like Google and Bing, have begun frowning upon this blackhat tactic for acquiring backlinks. The most rewarded and relevant authority-generating strategy for backlinking is networking with other professional entities (companies, digital influencers, etc.). By developing a mutually beneficial relationship with online business partners, you’ll often be able to swap links to and from each other’s digital properties. A few examples to get you thinking are news outlets (both local and national), past and current customer reviews/mentions, professional and non-profit associations that you’ve participated with, etc. These inbound links play can help increase your SEO if used properly. One of the best ways to drive more traffic and rank better is through the use of backlinks. Backlinks are what tell search engines how reputable your site is. Without a good reputation or site authority, your page will not do as well in searches as it could. When one site links to another, search engines deem it more worthy of appearing in various search results. Because the search engine’s main goal is to lead users to the best results possible for their inquiry, backlinks become very important in displaying subject expertise and page authority in order to gain page rank. The more backlinks, the better. However, quantity does not always equal quality. In the case of backlinks, it is better to have a few high-quality backlinks than a hundred low-quality ones. The higher their quality, the more trustworthy your site can become. As your site becomes more trustworthy, the better your SEO results will be. Backlinks can be earned in several ways, and are worth the time and effort you may have to spend in earning or building them. A few ways you can get backlinks to increase SEO are listed below. Guest Posts – When exchanging guest posts, you are contributing free content to another site or blog in exchange for a link to your own website. You are probably already writing blogs and content for your site, so this is a pretty easy way to gain backlinks. Skyscraper Content – The Skyscraper Method is using content you already have and making it even better than it was before. Choose a blog or content that you think is link-worthy. This can be something that was largely successful or popular when it was first published. Once you’ve chosen what content to work with, make it even better than it was before! You can do this through a number of ways. If it is a blog that contains a list of five items, make the list longer; increase it to ten items. If this blog was written a while ago, check to make sure all the information around that topic is up-to-date. Update the design to encourage more visual stimulation. You can also add more keywords. These are simple improvements that will take less time than writing a brand new piece of content. After you have finalized your updates, let people know about it. Announce that the blog they had loved so much before has been improved and is better than ever. When building or earning these backlinks, you will want to make sure they are on a website that is relevant to your own. It is important to also keep in mind the authority of the site you are backlinking with. Trustworthy, popular, high-authority sites that link to your site are considered the most desirable backlinks to earn. The stronger the site, the better the results your backlink will provide. Lastly, it is important to remember that the goal of earning and building these backlinks is to drive traffic to your website. Through implementing these practices, you will find your site gaining higher authority and trust within search engines, in turn leading to better SEO results. 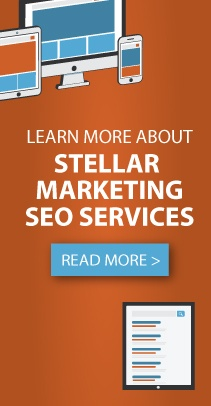 If you want to learn more about backlinks and SEO strategy, contact Stellar Blue today! Our knowledgeable team of experts is excited to help you reach your business goals.